Except for The Tribunal, the Gods play no direct, active role within this game. 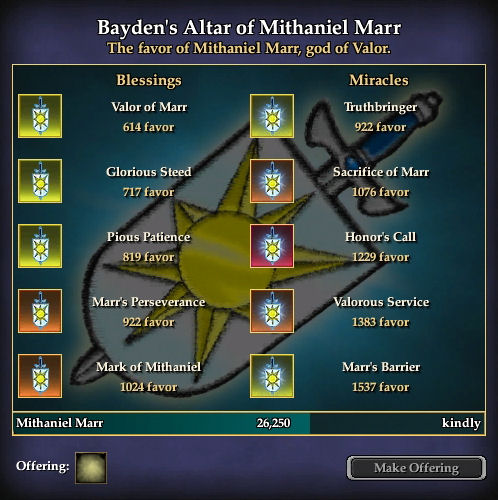 Mithaniel Marr, the Truthbringer, governs the Plane of Valor. Twin to Erollisi Marr, he is responsible for the Origin of the Barbarians and Frogloks with his sister in the Age of Monuments. The Followers of Mithaniel Marr believe that valor is what separates civilized beings from beasts. His followers live by a strict moral code that prizes truth, honor, and charity. They are champions of the downtrodden and the most noble of warriors. His followers strive to rid Norrath of all things dark and evil, often sacrificing themselves in this never ending quest. They will not rest until the day when all of Norrath is cleansed in Mithaniel's light. They take themselves and their duty very seriously, and have little patience for mischief or mayhem. Many paladins are devout servants of Mithaniel Marr. Towering above most mortal men in all manner of being - stature, morality, valor, honor, and battle - the presence of one known as the Truthbringer is an awesome thing to behold. Mithaniel Marr is the pure, untainted embodiment of all that is good and just within the hearts of the greatest of mortal heroes and deeds. He embodies selfless dedication and sacrifice, and the urge to combat all that is unjust, cruel, and tainted. His followers strive with every fiber of their being and existence to uphold these virtues. he corporeal manifestation of Mithaniel Marr's consciousness is a vision so pure that any mortal conception of perfection would most likely be grotesques in comparison. His armor is flawless and shines so brightly that it is almost unbearable to gaze directly upon it. Locks of golden hair drape down from his helm, which protects the suspected beauty of the face behind it. His blade is one of unrivaled craftsmanship of simple, piercing beauty and infinite precision. The divine realm that he governs, the Plane of Valor reflects his purity and the ideals of valor and honor. An almost unbearable perfection and beauty is seen in every corner of the realm, as only worthy heroes of self-sacrifice shall walk with The Truthbringer through these halls of ivory, gold and silver. This page last modified 2012-05-22 13:44:26.